It is said that computer is your child . If you safe it then you safe your child . So,won't it be interesting to find whether you have an electronic girl or boy.Today I will show you how you can find it Just try it, Its amazing. Open notepad and enter the following command. Now save it and you are done . 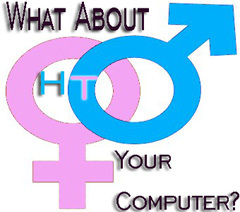 Open gender.vbs and your computer will speak what is my gender? Observe the sound . If your computer is a girl then it would speak in female voice and if it is a boy then it would speak in male voice, Interesting? Isn't it :-D.